This 1,000-round bulk pack from Military Ballistics Industries (MBI) is an excellent way to stock up on 9x19mm ammunition for an upcoming class or rainy day storage. Each cartridge bears a 124-grain plated round nose projectile which offers smooth, seamless feeding in a variety of firearm actions. The weight is also highly standardized among 9mm NATO loads and produces a balance between recoil impulse and alignment between sight and impact. The bullets, which are sourced from Berry's, are well-known for their plating's strength and precise ogive shape. MBI completes the rounds using Winchester or CCI primers, Hodgdon propellant, and brass casings from varying origin. 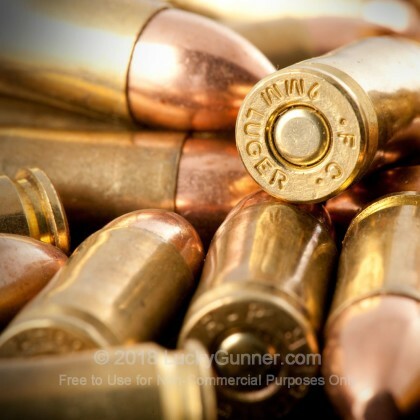 The casings, which may come as bare brass or with a nickel coating, have been subjected to a thorough certification process before reloading. During this inspection, the cases are cleaned, checked for cracks, and reshaped to the proper dimensions for the 9mm Luger caliber. MBI’s ammunition is well-recognized as a inexpensive option for training and plinking. Military Ballistics Industries makes ammo in the US designed for economical range in training use. Due to a few cost saving measures, MBI ammo is offered at a competitive price point to fit almost any budget. All MBI ammo feature once fired brass or nickel coated brass casings gathered from law enforcement shooting ranges. This is reloaded ammo, but it's not like what you'd make in your basement. It's all done on high tech automated machines. And other than the used cases, it's very similar to factory new ammo. MBI also uses copper plated bullets rather than the traditional full metal jacket. The copper plating is thinner than a copper jacket but performance is very similar. I shot thousands of rounds plated bullets and not had any problems with reliability or accuracy. But it's not recommended that plated bullets be used with ported barrels since the ports can shear off the copper plating. Plated bullets are also less hazardous for use in indoor ranges since there's no exposed lead anywhere on them. For this test we shot the 124 grain 9mm MBI ammo. We had no problems with function or reliability in any of our seven test guns. Accuracy was good too and even came out a little better than our MBI 115 grain tests. You may not have heard of Military Ballistics Industries before, but we've gotten a lot of great feedback on the website. So if you've got any doubt, just check out the reviews section. I bought 1000 rounds, since iv’e only shot one bag (100per bag) take this with a saltine. All 100 functioned perfect, in fact they have been more accurate in my pistolero than WinWhite. However i have seen some hard crimps in the bag they all functioned just fine. I inspected the entire bag before shooting and the primers were all perfect looking, all the bullets were seated to same height, no dents in the brass, the only thing i noticed were about 20 of the 100 had hard crimps around the cases. i’m up to buy more since this is a smaller ammunition manufacturer in the USA doing something different with second reload brass and seemingly good quality controls. I have 200 rounds left of my initial 1000 rds ordered. I gave quality a 4(4 3/4 really) only because about 7 rounds so far were aluminum cased, and my range is brass only. Not a real big issue, but shipping and performance are outstanding. Ran 1,000 through my Sig P320 over the course of a month. There were three under powered loads, one squib. Only one of thee under powered loads failed to cycle properly. Not bad for bulk reloads. Not to dirty, I have shot Remington that leaves noticably more residue behind. Still, felt the need to clean after every 200 rounds. For the price, I am happy with the overall perfomance. I would recommend these rounds for range practice. Had maybe 5 or 6 rounds that were either crimped wrong or the bullet was seated to far into the case. Over all it did everything I could have expected out of it. not a bad price for 1000 rounds with only a few minor issues. I've bought these several times in 1 or 200 at a time. Was satisfied every time. Went ahead and ordered 1000 rds. Never a problem shooting them through my Canic, gave a 100 rds. to friend who shoots a S&W, no problems fired well. Gave a 100 rd. pack to my cousin who uses a Block. Said he was very satisfied as far as a range round and you can't beat the price. We have been using this ammo as our range rounds for 3 years now. In those 3 years, I'd say we have used 6 case lots a year so 18,000 rounds now. In all that we have had one round that would not fire and a total of six spent cartridges that did not eject properly, that could have been poor grip by self or wife as a issue also. I highly recommend this product and lucky gunner is awesome as a shipper, product usually arrive in 2 days from order placement, never longer than 3 business days. From order to shipment is usually a lightening fast 12 hours or less. I have bought these a few times before and they went well. No major issues. I understand buying this type of ammo is a risk with having an issue or two in the 1000 round box, however, the last 1000 I received were so bad, I won’t buy these again. I had 5 squib loads in the first 2 bags. In 3 different guns, so I can’t even blame the gun. I don’t know it’s this is a quality control issue or if I got lucky the first two purchases. I hope this helps someone and I hope they work well for you. I couldn't even use these rounds. The reloading was done so poorly that they wouldn't cycle or eject. Bulging cases and bullets set too deep in the case. This ammo is dangerous to try to use. I bought 1000 rounds and I have to throw 985 of them away! Do yourself a favor and buy something else. Purchased the 1000 round count after an evaluation of a single 100 pack. No issues at all with either. Shot nearly 800 of the 1000 and each one goes bang and flies towards the backstop whereever I am aiming; not much more you could ask for. Already re-ordering. Have been through about 3000 rounds with 124 grain in a Canik, Springfield and SCCY with no problems. Great value, like the price for brass casings. These used to be my go-to range ammo. My first 2000 rounds were flawless. Bought another 2000. First 1000 performed as expected. Second 1000 must've been a bad batch. I would see around 5 squib loads every 100 rounds. Great Buy, Very Clean, No Issues. Very clean, no malfunctions used in multiple weapon systems. Just put 200 rounds of this downrange in a Ruger PC9 and Hi-Point 995. No failures to feed, no failures to eject, no failures to fire. Not a very dirty round either. Great value for range ammo. I bought this re-manufactured ammo to make the range trips a little cheaper. I've run several hundred rounds through my Sig P226 and Sig M11A1 and this ammo has worked flawlessly so far. No failures to report and it's every bit as accurate as the 124gr FMJ I normally run. The last batch of 1,000 I purchased was horrible. I literally had a 50 round ammo box nearly full of squibs that I had to rod out of the barrels of my handguns, dead/non-functioning primers, casing pulled back from the bullet, and dented casings. I'm not blaming LuckyGunner for this, and will continue to use their buisness. But I will never buy MBI again. There are some serious quality control issues. I have used several thousand rounds of this stuff and became concerned over the bad reviews I started seeing. Lo and behold, I was in a combat pistol class and stuffing my Glock mags when I felt a funny round. It was brass case with a partially seated bullet but no powder. However it did have a primer. That would have been disastrous had I not had eyes on it when I was loading. A squib can be very serious. I am weary of this stuff now and went to Winchester NATO instead. A few bucks more but never had an issue with that. Bought 500 rounds of this ammo because I was sick and tired of Winchester White box letting me down at the range. I went through this reman ammo so fast bc every single round functioned flawlessly. I ran them in a variety of hosts including Gen 4 Glock 19 Gen 3 Glock 22 with Silencerco 9mm conversion barrel, QC10 AR 9mm. Ammo functioned flawlessly unsurpressed as well as suppressed. Great value. About to get more. I'm a novice at this, but I've fired perhaps 700 rounds through HiPoint 9 semi and HiPoint 9 carbine, without any failures of any kind. I will continue to use this for range practice. And love dealing with Lucky Gunner. They are tops with price and delivery. I'll admit I was quite skeptical when I made this purchase. However after going through 300 rounds at the range yesterday (M&P9 Shield 2.0 and Ruger EC9S) had zero failures. Ammo does shoot a little dirty so you might want to clean afterwards, but for the price this makes good range ammo. Good Ammo can't say anything bad about these rounds I have fed 2800 rounds through my p320 only had 1 bad round it didn't fire when striker hit it but that's it over all its one of my go to ammo. No fail to feed or fail to fire. Have shot over 4000 rounds of this at the range without a problem. Very happy with the price and the quality. I have purchased 2000 rounds of this ammo for use with my Beretta 92FS. However in the context of reloaded, low cost, affordable, practice ammo (especially for beginners getting into high volume handgun shooting); this ammo is OUTSTANDING. It does not replace the need to buy proper HP self defense rounds and eventually (for those interested) higher grade target ammunition but, it serves it's intended purpose flawlessly. Definitely would recommend for new shooters and high volume training. I have ordered 9000 rounds over the past year or so. I have shot them through Sig P320s, X-five and a Glock 17 and 19. Out of those 9000 rounds, I have had one squib, 5 or 6 light primer strikes that fired the second time. They feed and extract very well. I can’t remember a fte or ftf using this ammo. This is my go to range ammo hands down. Still a good bargain for me. Shot 420 rounds yesterday in 3 guns with zero load or eject problems. Great target ammo for a very respectable price. I have shot thousands of rounds of this stuff through several pistols without a single failure. I will continue to buy MBI!! I've shot 2,000 rounds of the 9mm through my CZ75 without a hiccup. It's now my range brand. I've found it to be as clean and on target as the Winchester, Remington, and Federal rounds I used to buy. I've shot 700 of the 1000 so far, no malfunctions. Shoots straight as any other ammo. A bit dirty. Would definitely order more if just for stacking. I've run thousands of rounds of MBI, only one FTF, zero FTE. It's clean and consistent, my preferred range ammo. Shot over 500 rounds today through 2 pistols and a rifle without a single problem. I love this stuff. I've fired 2000 rounds without a misfire or failure to load. Will order again. 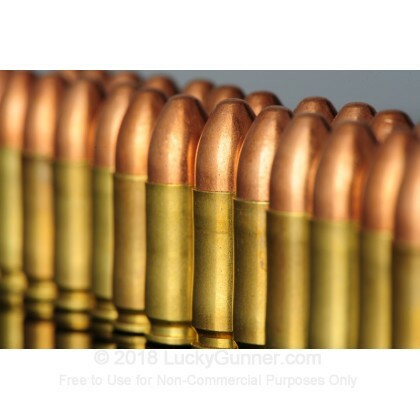 great price for bulk ammo and the service and shipping was unbeatable. didn't have any failure to feed or failure to eject. all my groupings were solid as well. will definitely be buying more! We've used about 10,000 rounds of this ammo... no issues really at all. Maybe less than 5 failure to feed. That could have been limp wristing... We use them for practice as well as action shooting. Guns? Walther PPQ M2 9's, Sig P226 Navy, Ruger LC9s, Walther PPS M2, S&W Shield, Glock 17, S&W Core 5L Ported. We ran a handful thru a Model M1938 full auto, dad's CZ, and probably a few that I've forgot. This works in our world... pretty flawlessly. I was a bit skeptical, but the reviews were on point. This stuff works, and already went through 250 rounds and did not have any malfunctions, failure to feed, or failure to eject/extract. I will be switching to this for range ammo for both my 9mm and .40 going forward. Would recommend to anyone that needs a good stack of range ammo. I have bought a grand total of 2000 rounds of this ammo, and have had one squib load. Sadly, this squib load did enough damage to my brand new CZ Scorpion Evo 3 S1, that I've had to send it to the shop for repairs to the extractor. Great value, but I have also had a many "duds" as well that failed to fire even with a solid firing pin hit. Based off of the one squib load I did get, that alone is enough to keep me from ordering this ammo again. I have used well over 1,000 rounds of the MBI ammo at the range with no issues at all, in a variety of pistols. It is clean for target ammo, much better than some of the new ammo that I have used. A great value. After attempting to fire 300 rounds of this ammo 20 of the rounds were out of spec and did not chamber in my Glock 17 in fact they actually seized up the Glock and the only way to remove the round out of the barrel was to strip the gun down along with a complete disassembly of the slide. I then had to pound out the rounds with a cleaning rod. I do not recommend this ammo if you do purchase it please inspect each round carefully. 500 rounds thru an xd and a smith and wesson.no issues .everything went bang. Have shot about 500 rounds of this in three different pistols and zero failures. A few steel casings were mixed in, no biggie. I haven't fired as much of this as some other reviewers, but just finished up my first thousand. No failures if any kind, did what it was supposed to. Several thousand 9mm rounds in two Beretta's and two CZ's. Very few problems. My third Beretta, a PX4 Storm sub-compact, won't shoot this, but it is kind of picky. If/when I get a bad batch I might change my mind, but right now it is a good value for me. I've bought this ammo three times. No problems with the first two 1000 round purchases. The last purchase has not been good. In the first three bags (300 rds) had 6 FTEs and two squibs. Bad batch, maybe, not sure I'll continue to purchase this product. Have gone through a few hundred rounds with zero hang ups. Good price for a great quality ammo. Fed through my semi auto Walthers perfectly. Have fired over 4000 rounds of this ammo with only two misfires. One was a primer problem and it fired on second try. The other didn't have powder in it so it stuck the bullet about an inch up my pistol barrel and I had to knock it back out. But overall very satisfied. I just received another 1000 rounds two days ago. Used about 200 rounds so far going as advertised. My wife and I have gone through 4-6 thousand rounds of these so far, and have not had any problems. If you want a high value brass ammunition for training or plinking, this is hard to beat. Finished 300 rd today and the accuracy of the shooting is so impressive, no other brands I've used (4~5 of them) can do that. I used a Sig today and has no problem with this ammo. Ordered another 1000 rd today. The price is... I guess I don't need say more. I had used this ammo for competition for some time now.It was great up until this last batch.I don't know if they changed primers or what but its been very unreliable. Bang for your buck that doesn't always go bang. I'm on my second order of 1000 rounds of 124gr by mbi, I bought this because it was extremely cheap and I shoot 3gun and do so on a budget because I'm military. My first order of 1000 only gave me like 5 light strikes, this second order has given me 10 and I've only gone though probably 150 of the 1000 rounds. I had mainly just shot steel with it at matches but over the holidays I went out to my land and put some rounds on paper and I think the consistent 2 inches left are my rear sights being off when I had the guy put them on but I noticed that I would every so often get what seemed like a bigger flash and the round would go about 6 inches low and left. You can tell the ammo is mixed reloads because you have all sorts of different brass. For plinking on your own time this stuff is a good value but for me in 3gun and USPA having to clear light strikes and having some inconsistent loads is a pain so I might as well spring the extra $20 for blazer brass. I've been through thousands of rounds and love this stuff. No problems at all. This is my go to ammo in 9mm, and my go to source is always Lucky Gunner for the best ammo value. I've shot over 3,000 rounds through various 9mm pistols and carbines with no issues whatsoever. I have had a few failures with winchester white box during the same outings, but this stuff runs great. I purchased 1000 rounds and shoot 100 rounds a week at the range. So far I'm impressed, for all those complaining not all guns (especially GLOCKS) like all ammo on the market. So far I've had no misfires or Squibs. First time to try this ammo, very disappointed. Without exaggeration 50 to 60% of the 1000 rounds I bought will not feed my stock glock, after closer inspection, the casings are over expanded. Very poor quality control. Never again. Also I did some research and tried to email the manufacturer, no response after two tries. Bad round for my Sig Sauer 938. I had a squib, which stopped my range experience cold. The Range gunsmith removed the squib and said, "do not use this round anymore." So I stopped. Even though it is a one time reload, I would expect better from a round that not not significantly cheaper than a factory load, like the Blaser. I also had many failures to eject and double feeds. I would not recommend this ammo unless you are looking to create a grenade and blow up your barrel. Someone must have been sleeping on the reload job. Not enough powder or low quality powder. Enough said. I am very disappointed, especially because I ordered 1,000 rounds. Most of the time, cheaper is not better. Take care of your guns and buy something else. I purchased this to stock up on my current ammo supply, and was very impressed at being able to get 124gr ammo for about the price of imported 115gr. The ammo all is packaged well and passes inspection. When I get it on the range, I expect it will do quite well, based on other reviews. This is more about the service I received from LuckyGunner. I was very pleased to have my order processed quickly, and received my order within 3 business days, at a reasonable shipping rate! The last bulk order I made was through another vendor, and their "in stock" ammo took 2 weeks to process, and another 2 weeks to arrive at my door, for a much higher shipping rate. Way to go, LuckyGunner! You have earned my business in the long term! 2000 rounds thru G19 and G17 with no problems. Great price! I've fired close to 2000 rounds in my S&W M&P Shield. Never a misfire or fault of any kind. I took three hundred rounds to the range with me at Shoot Straight in West Palm Beach Florida they say no reloads. So I had to buy their in-house ammo. Other than that no problem. I bought this ammo to shoot from a stock CZ SP-01. I've gone through about 600 rounds so far and get at least 4 failure to feed and 2 stove pipes for every 100 rounds. In addition, the slide won't lock back every other empty magazine. These issues do not happen with any other 9mm ammo I've tried yet, so needless to say it's incredibly frustrating after I bought 1000 rounds of this stuff. Upon farther review, the muzzle energy of most 9mm is in the 330+ ft-lbs range. This ammo is only 304, so it seems to fail to push the slide all the way back on the reasonably heavily sprung SP-01, resulting in continuous failures. Even though it's cheap, I had to decrease the value rating because it simply doesn't work for me. Second- 1000 round order. Not one bad round found through Sig nightmare. Even loaded up 5 six round mags and ran through all in 30 seconds. Sig and ammo worked great. I have been shooting new ammo until now, and always 115 grain, but I thought I would try this based on price and other reviews. I found this ammo dirtier than the new stuff (mostly American Eagle). In the first two bags (200 rounds) I've had 2 rounds fail to fire. No jams or FTE. I compared this directly to the some of the AE 155g on the same day, same distance, and I found that this stuff was hitting low at 7 yards. Not sure I can blame the ammo, but my first magazine of 115g all hit inside a 4" circle, and only half of this 124 hit the circle. More practice rounds coming up in near future. Fast shipment as always from Lucky Gunner. Have about 45% failure to eject in last 1000 rounds. Used to be fine for several thousand rounds. Now, big problems. Took 20 bullets to gunsmith. He put them in 9mm die. Casing in 40% was swelled at bottom of shell. He thinks the reloaded casings have been fired in a Glock, causing the swelling. Won't buy these anymore, if their QC isn't that important to them. I need performance. If you're reading this to decide... buy them!! I just put in my 4th order of these. I have hade one issue in 3k rounds. They're great for practice rounds!! Plus they are a great price! Luckygunner.com ships very quickly and I have not had an issue with them either. Shoot with safety in mind at all times!! This stuff is reliable and a really great value. I've gone through about 500 rounds of my first order without a single bad round. I'm ready to stock up on some more. As usual luckygunner service is perfect. Shipping is lightning fast. For the money this great practice ammo. Occasionally I will have 1 or 2 bad rounds in 1000...no big deal when dealing with reloads. I bought these to shoot in 2 brand new unfired 9mm pistols; a Walther PPS and a CZ P07. I also shot my 357 and my 45, but that's another story. I shot 50 rounds in each of the 9mm pistols with no problems at all. The groups at 25 ft were excellent. At first I was more accurate with the Walther, even though it's smaller, slightly shorter barrel, and doesn't feel as good in my hand. As I got tired the CZ was still getting tight groups but I was losing my trigger feel in the Walther. I love both pistols and this ammo did well in both. I'm just 60 years old with arthritis and when I get tired I don't shoot as well. The proof is in the first 40 rounds I fired. This is reliable, accurate, just plain good range ammo. I'll get it again. Haven't shot but the time it took to arrive was fast. Keep it up and thank you for the great value for the ammo. Left black marks on my white t-shirt. First 800 no issues. Then locked up my Glock19. Opened up and gun was filthy after only 1 prior use since cleaning. Gonna go back to brassers 124gr. Great value. Put about 400 rounds through my SIG P320 so far and have had one misfire. Best ammo for the price...! When you spend a lot of time at the range, practice gets expensive! But this ammo is some of the best around for the price. No issues so far, and this order of 1000 rounds was NOT my first order of 1000 rounds! Order w/ confidence...practice lots...! I have made different caliber ammo purchases from Lucky Gunner in the past few years and never had any problem to complain about. Will be ordering again for my ammunition in the future. Great ammo for target practice. Never had a problem with the range people for shooting reloads. I am using the 9mm, 124 grain on my Glocks 19 and 17 and my Heckler&Koch P7 M8 and my compact Ruger LC9s Pro and I loved. I will keep buying the MBI reloads from you guys! Great service good price and fast delivery! I've shot about 1000 rounds ,This is great ammo and I will definitely be buying more. 10 bags of 100 rounds each. So far I have used 3 bags without any missfire. And so far I always find 1 nickel-plated brass on each bag. Brought 1000 rounds of 9mm. Excellent at the range. No miss fires no duds. Working on my second order of 1k rounds. So far not a single problem. Won't hesitate to more. This is our first 9mil. The BMI ammo has always worked great for us. We have purchased several thousand rounds in the past without any problems. Thanks. I've shot about 1000 rounds so far. In a Sig p226!Tac Ops, Glock 19 and a Sig SP2022. ive has a similar experience with each. Not one FTF or stovepipe. This is great ammo and I will definitely be buying more. This ammo is clean and performs very well at the indoor range where I shoot.. It loads easily and is packaged in 50 count packs. I would buy this again! no problems. Had first chance to go to range today with grand boys we shoot around 200 rounds on our new Glock 43. No problems, will order another bulk box soon. Why pay more to plink? Shot over 2,000 rounds so far out of multiple pistols an carbines. No malfunctions of any kind. To date, shot 600 rounds of 1,000 rounds delivered. No issues with this ammo. Used these for range practice for a church security team - guns fired in include Sig 320, 229, Ruger SR9C, & a Walther (model??). Shipping was quick (as usual)!! Won't hesitate to buy these again. Don't hesitate to buy this ammo for training purposes! I've so far shot 100 rounds through my XDS9 and didn't have a single problem what so ever. I will recommend that ammo to someone who would like the 1000 round bulk pack but is on a budget. I will say that I will be ordering this product again. I also like the fast shipping. I ran all 1000 in Beretta 92, Glock 17c, fns-9c and a glock 43. No problems whatsoever. One of my shooting buddies asked if I would like to split 1000rds to test out given it's low price per round so after checking out the website I decided to go ahead. Easy process to purchase and good shipping time. Once on the range we were taken back by the quality of this ammunition it was very reliable, consistent and accurate. We fired several different weapons including a inexpensive but reliable SCCY CPX-2, S&W M&P pro, Glock 19,17 and 26, Sig p228, Taurus pt-111G2, Intratec Tec 9 and a very finicky Kimber Solo. Out of the 1000 rds we had maybe 5 or 6 issues with a couple failure to fire in the G17 which can also be picky having a aftermarket trigger and different springs and a couple failure to loads in the Solo and Tec 9. For the price you can't beat that kind of performance and reliability we will be ordering several more 1000's for the range as long as the price stays right! Great buy.. shoot just fine.. perfect for the range and I love that they are separated in 100 round packs.. make it easy to grab an pack and head to the range. First off, I like doing business with Lucky Gunner, I always find what I need at a great price, and fast shipping too! Now the ammo: I shot approximately 200 rounds through my Glock 19 without a single problem, then one of the guys at the range talked me into getting a ZEV spring kit, which did make the trigger pull and reset feel a lot better, but out of the next 300 rounds I shot, I did have five that did not fire, buy hey, I can live with that! I will buy again. I've now purchased the 9mm 124 gr now twice with no regrets. No failures at all in an XD9C, MR9 and PT111 G2. Multiple targets at the range have paid the price for the rounds finding their spot. Will be buying these rounds for as along as they're available when I'm in need to purchase. When it comes to range ammo I like reliability and consistency. This is my 2nd 1000 and it meets my expectations fully. Good value, quick shipping, shoots well & easy ordering. Overall, pleased with purchase. Ammo shoots well. Easy ordering & shipping was quick. Good value. Only problem with bulk ordering, a couple of bags were open, with loose rounds in box. Gone through about 500 of my 1000 rounds haven't had a single issue. Price is still reasonable I might just order another 1000! Excellent product at a excellent price! Ran 300 rounds thru a Ruger LC9S and a Glock 19 at local range, zero misfires or jams, looks like this will be our go to range ammo. Shot several hundred of these rounds through a Taurus PT111 G2 with zero FTF (feed or fire), zero FTE. Can't touch this price anywhere else as well, including the local MIL base. LG delivers a qual product, with great CS. I have a historically finicky Lone Wolf/Timberwolf G34 style 9mm. I put 300 of these through it with a new barrel with zero drama. No other round I've used can make that claim. Making a strong case for being the go-to range ammo for me. YOUR PRODUCT IS BY FAR THE BEST VALUE FROM ANY OTHER SUPPLIER..CUSTOMER FOR LIFE..THANK YOU FOR WHAT YOU ALL DO!! My second order from LuckyGunner and no regrets. My wife and I went through about 500 rounds last Saturday and not one issue in a XD9c, Taurus PT111 G2 and MR9. Great value! Bought 1000 rounds of this back during the shortage (2012-ish) for a good price and never got around to shooting it all until recently. No issues in Glocks with standard barrels, but I had several issues with the tighter tolerances in an AAC threaded barrel. The rounds often would not fully seat, causing the slide to lock tight on a half chambered round. With my MP5 and MPX it functioned flawlessly but groups were marginal compared to Armscor, Am Eagle, and Winchester (all 124gr) during testing at 25 yards. If you're just shooting steel and not looking at groups, try it if you can get it cheap; if you're trying to zero or work on general marksmanship skills, get something else. A great deal on great ammo. Ordering was easy and it was delivered fast. 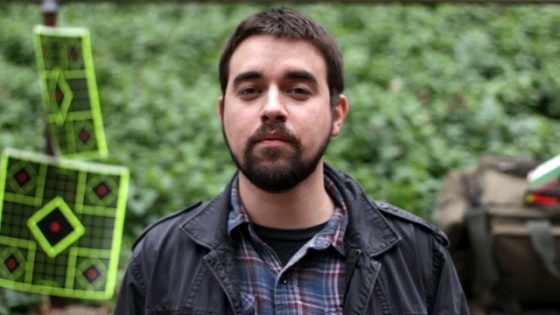 Impecable ammunition. Try it. You won't be disappointed. Shot off over 200 so far and no mis-fires. Accuracy is consistent. Will definitely get more of these. I don't see similar problems in other reviews, but I experienced an 8% failure rate across 400 rounds in two different well-maintained weapons. I won't be buying this ammo again. Excellent buy! I have shot couple hundred rounds with no problems. Buy these as you wont regret your purchase. like all good ammo and good reviews, I just shot them and nothing was wrong. They were clean shooting and I haven't had any issues at this point. I will be purchasing these again. I've put about 1,500 rounds of this stuff through my HK VP9 and Springfield SDX and have had maybe one or two jams - excellent range ammo! Picked up some of this ammo and it fires well, is pretty accurate and the price is right. Shipped fast too! I've shot a couple thousand rounds of MBI 124gr. 9mm through my firearms. Only had one FTF so far. Not a big deal, that's why I was on the range. Practice. Tap, Rack, Bang. Really happy with Lucky Gunner and MBI. Now I'll stick to the American Eagle, PMC, or Blazer Brass at the same price. Outstanding Price for great training ammo. If you are looking for ammo that is at a great price for a large quantity, this is should be your top choice. You will not be disappointed. I have purchased more than 3000 rounds over the last two years and have never had a problem. This ammo might not come packaged in nice boxes, but who cares when the ammo is super reliable. As soon as I receive this ammo, I put it away in my own storage containers that I take to the range. Highly recommend if you shoot large quantities of ammo throughout the year. With a Glock 22 and a Glock 34 I've shoot 2000 rounds of 40 cal. and almost 1000 rounds of 9mm MBI without one misfire. I plan to buy additional bulk packs of 1000 rounds as they come on special. I'm very happy with the quality of the MBI ammo, the manufacture undoubtedly takes pride in their product. It's not match quality ammo or I would have given it 5 stars, but it is definitely just as good as any standard target ammo. I shot 200 of the 1000 rounds I bought so far and haven't had a single issue. It fed through three different guns, a S&W M&P, Walther PPQ, and Beretta 92. I would buy it again in a heartbeat. Shot 300 rounds no jambs or misfires. Great ammo and service is SUPERB!! Will continue to purchase my ammo needs from Lucky Gunner. Shot 200 rds,2 bags and had 2 rounds that bulged badly. I purchased 1000 rounds from Lucky Gunner, the 124 FMJ for the purpose of becoming more efficient pertaining proficiency with a handgun. To date, I have fired approximately 400 round from this batch and I have to say that I am extremely pleased with the quality that Lucky Gunner sent me. I spent the time to box up the 1000 rounds and the count was precise. I have Not experienced any problems with this ammo and it is extremely accurate for range ammo. It cycles flawlessly out of my 1911 as well as my new HK VP9 that I just acquired today. Both pistols fired this ammo without a single inconsistency in performance. No stove pipes, no non-fires, no over pressure no anything except excellent performance. I will most definitely return to Lucky Gunner when I run out of ammo or get close to needing more. Oh, and my wife has also fired approximately the same number of rounds through her G19 Glock with the same results. She is very happy with this ammo as well and her shooting skills have advanced greatly due to her confidence in the ammo she is shooting! Thank You, Lucky Gunner, for Quality Ammo at a very Reasonable price. The best I have seen so far to date. Look no further for the best 9mm round for your dollar. Maybe I'm lucky and haven't come across the one problem round but all 1,000 rounds have gone down range. I have already purchased another 1,000 rounds to validate the performance of this product and will most likely purchase another after that because of the deal. This ammo is cheap and reliable. I shot it through a Beretta CX4 and 92FS. I've shot it through a XDS 9mm in the past. It cycled properly and hits in consistent groups with all of them. Other than the neck bulge during reloading, it's just like brand new ammo but at a bargain! I've shot literally thousands of MBI rounds, in .40, .45, and 9 mm, all ordered from Lucky Gunner. Not one single failure. Ever. Just buy them. I have used MBI products in .45 ACP and never had a problem. I find the same to be true for this 9mm buy. Feeds great. Fires great. No problems. No a one. In my experience, a great buy for your 9mm range time. Thus far, I highly recommend. Excellent ammo, great bang for the buck, as usual LG was very quick to ship. Have sent about 2000 rounds down range without a single malfunction, you can't beat this ammo, and Lucky Gunner is always very quick to ship, 2-3 days to receive. Great product, haven't had any issue due to the ammo. I love this ammo ! I've bout a few thousand rounds for my guns 9mm, 40cal , and my 1911 45acp ! I've never had any problems I use it it all my guns everything from Taurus to my M&P even my hi - point but I've put a lot of rounds throu these guns with this ammo and maybe 1-2 ftf best bang for your buck ! 10x better then wolf ! This is my 4th purchase of these MBI rounds from LG and I simply LOVE both LG and the ammo. I've shot over 3,500 rounds of this with only about 10 FTF or FTE! As always, this is my 'go to' range ammo, as it's consistently accurate (as much as I can be), and it matches my home defense rounds (Hornady HPs) so I know what to expect for recoil, re-acquisition, etc. Lucky Gunner again delivered quickly...ordered this Thursday morning about 9:45-10:00am...and it was on my doorstep when I got home Friday at 5:15. What great service!! It's nice to have a site that actually stocks what they advertise, has great prices, and I recommend LG to all my friends primarily for these reasons. Keep up the good work! I bought 1000 rounds of MBI 9MM. I have fired about 500 rounds, through my springfield XDM 3.8 with absolutely no problems. great ammo!!!! Ran a 1000 through my Glock 17 and it chewed through all of it. Not one FTF/FTE. Its a little dirty but ran great and is perfect for a couple trips to the range. I purchased this and had not one issue. Looks great, feeds great, shoots great, and extracts great. It is very accurate to at least 25 yards, as far as I shot it. Fast shipping as well. My most used round at the range. Love Lucky Gunner and MBI. Out of many hundreds of rounds, only 1 FF is all. And I attribute that to a weak spring in a 33rnd glock magazine toward the tail end of empty. Standard mags are like a Swiss watch with beautiful and consistent ejection. Shoot these in 40mm with no problems all day long, however lately this in the 9mm is just not cutting it. I'm having so many FTF rounds constantly that it makes shoot not fun. It gets to a point that if just one of my many magazines was to ever fire every single round, I would be in shock. And it's not only my gun (XDM) as I would give rounds away to my friends and they all report the same thing. It's a shame cause like I said above, this in the 40 is solid! Don't know if they changed something in their process recently because this problem only started to happen this past year. I have been buying this round for a few years now and it will make me choose a different brand for 9mm. I have been very pleased with the performance of this ammo, the arrive in a timely manner and you can't beat the price (mind you, I only use them for range practice). The only thing I would complain about is the boxes are always very damaged when they arrive but thus far none of the bullets have been affected. I will continue to buy my bulk ammo here. I ran 300 rounds through my Glock 17 at a recent advanced pistol class and I had no issues with the ammo at all. The only 2 jams I had were on the same magazine and the scoring on the actual bullet portion of the round was indicative of no enough spring pressure to chamber the round. I tossed that mag and had no more issues so I don't blame the round at all. Also accuracy was fine in my expectation, as long as I did my part I kept it all in the 8" black circle out to 25 yards. Let's put it this way, I would have to be a better and more consistent shooter to need anything more. never missed fired and I shot 100 bullets at the range. I have fired thousands of rounds of this ammo - have yet to have a round not fire. I use it extensively in training and I have never even had a malfunction with it. Great ammo as far as I am concerned! I've shot over 5000 rounds so far, and haven't had a failure yet. Now failures are inevitable with moving parts, but the ammo shows itself to be pretty damn reliable so far. I was using these rounds in a Glock 17 at an indoor range. And had a catastrophic failure. One round exploded in the pipe, the back half of the casing blew off. Gun is destroyed, luckily no serious injuries. If you are firing Ball ammo, this stuff is perfect; I have never experienced a failure firing over 1000 rounds in an M&P 9L... no failures to feed, chamber, fire, extract or eject... I wish I could say this about some of the more expensive stuff. I have only fired 400 rounds so far but I have not had any problems. I will buy these again. For practice I don't think you'll be disappointed with this product. Satisfied with my order, will be buying again when needed. I've shoot 300 round through my H&K VP9 without a single misfire. Great product for the price. This does everything you expect factory ammo to do. Remanufactured ammo is cheaper because it reuses the only part of a round that can be used over and over again: the brass. There is no reason to buy other factory ammo for practice, unless you have specific training or performance needs. Ammo showed up way faster than I expected. Lucky Gunner has also fought those who wish to suppress our Constitutional rights. So if you have no other reason to buy from them, keep in mind that companies like these help keep our liberty in-hand. Great ammo - great price! I recently purchased 1000 rounds, have fired 200 of that 1000 thru my Beretta 92 fs no problems. Plan to buy more soon. The item arrived with-in 3 days after ordering. Good quality product, not one bad shell yet. Would definitely purchase again. Quality, service excellant ! Goes bang every time, feeds perfectly and always locks the slide back on the last round from my M&P - something 115's have trouble doing. Every now and then some brands of 9mm ammo will be on sale for a better price. But every other day, this ammo is a quality product at the best price. I've shot thousands of these rounds with out a single misfire. They are also clean, accurate and you can't beat the price. For target practice you can't go wrong with these rounds. I would definitely recommend this fine product to anyone! Good range ammo. Purchased previously same ammo and had no problems with the ammo. I like this ammo and the price. Purchased 2 times previously same ammo and had no problems in my Glocks. Nothing much to say, cheap bulk ammo. No jams, works well with the Glock 19 and 26. Never had an issue, shot all 1000 rounds. Great stuff at a great price. This was my first time ordering ammo from then. They got it to me quickly, was very affordable and I will definitely use them again. First 500 had a two duds, second 500 had one dud and three that jammed up and I had to use rubber mallet to get them to chamber. Not worth the hassle. Jammed up in Sprinfield XDM and Glock 19, no issues in Smith & Wesson M&P but that might have been just been random luck. Will not buy again. Will spend extra money for no hassles. Bought these 9s for my son and grandson. No problems at all and well worth it. Thanks again for another good order from Lucky Gunner. I bought 1000 rds in mid Sept 2015 and shot it through Sig P229, M11-A1, Glock 19 & 26, and Beretta 92 Compact. Not one problem or any failures to fire or extract. 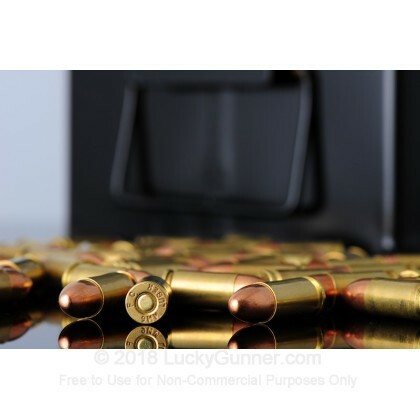 Best price for a brass cased 9mm. My Glock 19 has not had any problems with this that I can remember. I have used them quite a bit as they are extremely inexpensive and they have performed well for target practice and training. lucky gunner ships fast, and they always follow up on your satisfaction. they are great!! Good prices too!! I've shot over 3000 rounds of this ammo with only 2 FtEs and 0 FtFs through a variety of handguns (albeit primarily Glock and Walther). Based on other reviews, perhaps I've been lucky, but my experience has been great with this ammo and I will continue to recommend it. I think it's a good value for the money you save on the ammo, but I have noticed a little inconsistency in the rounds. For the most part they're about the same, but some shots come out a little hot and some shoot a little low. I had one round (only) that didn't even have enough power to eject the catrige from the gun, but for the most part I'm satisfied with my purchase. For plinking targets I would buy these again. A little smokey for an indoor shooting range otherwise a great value. The first 3000 bullets I purchased were excellent with less than 10 jams or misfires total. My last order of 1000 has been one big disappointment. Less important is that the bags of 100 were not sealed properly on the bottom and went everywhere when lifted out of the box. Most important is out of the 200 Taken to the range I have at least 1 in 10 that does not fire and jams up. It's like they have totally removed any and all quality control. Before my last purchase I would have given a full five star review. I've fired thousands of MBI's 9mm and I've only ever had 1 bad round, and that was a poorly seated primer. Otherwise an excellent quality product, definitely a good buy for those looking to get a lot of practice. We've been very happy with this ammo - great price and great shooting and fast shipping! Highly recommend it! Not one misfire or jam. I shared this order with 2 other friends and not one of us had a problem on the range, great value, great performance. I'll keep coming back for more...!! Not one problem with this ammunition. Ran through all 1,000 and reordered another 1,000 on 09.08.15 and should arrive Monday, the 14th. (West Jordan UT) Guns used: Canik TP9-SA, H&K VP9, FNS 9 and S&W M&P Pro 5" 9mm. Good stuff. I wouldn't have a problem recommending this manufacturer. It went bang, shot straight, extremely happy with these rounds and Lucky Gunner's service. I have shot every round of the thousand and no issues at all. Will purchase again. I purchased 1,000 rounds and went through 300 today at the range with an H&K VP9, Canik TP9-SA - not one issue!!! I actually would carry this. Bleeding through two holes! I will be buying another 1,000. I purchased this product twice [1000 rounds each purchase]. The first 1000 rounds resulted in approximately 10% failure to fire. The second 1000 rounds resulted in more than 25% failure to fire. The aforementioned results were realized firing Glock 26, Glock 19 and Glock 17. To ensure I was not experiencing a problem with my Glocks, I purchased the most inexpensive Federal ammunition I could find, fired 500 rounds through each of my Glocks without any issues. Summary: In this case, buyer beware. I will never purchase BMI ammunition again. 200 rounds.....No jams. No issues. Great value. I fired this ammo out of Glock17 and 43. An American Spirit Arms AR and an S&W M&P. Not one problem. I will buy more very soon. Overall good but a little dirty. Fouls gun badly and requires good cleaning after firing. Had one round out of 500 swelled so badly (not properly resized when loaded) it would not chamber and action had to be hammered open. (Could not work the action by hand) Bullet had to be hammer driven from the chamber. Range session ended early that day. Will continue to use this lot but with caution. Military Ballistic Industry (MBI) Lot#46016. We've shot thousands of these rounds and never a mishap. Great ammo and great price. I have fired about 100 rounds of this ammo with no problems. Clean, burr free casings. No FTF, but a few FTE's. Very occasionally a hot round that is louder, smokier & sends a shower of sparks. Not problem enough for me to stop buying it! Overall an excellent value. Shipping is always amazingly fast! The last 2000 I have had many jamb ups. This is hard on extractors too. It has been in more than one gun this happens in. They need to QC their ammo better. I have bought thousands of these rounds and have been very pleased with the performance. Very few squibs or FTE, I will continue to use this product, as always, great customer service from Lucky Gunner. All fired and no jams....I'm very pleased with it and will buy more. This is the second 1000 round order and they are great for practice. No failure to feed or any other problem. Good value. Wanted alittle more punch. No failures with these reloads, ejects with no issues and great price for 124 grain. Went to the range today and put approx 200 rounds downrange. I had about 6 rounds not fire, when I reloaded them in the mag they fired the second time. This is my first order of 9mm MBI (typically I buy the .40 cal MBI and have not had 1 issue). Hopefully these will be the only ones that I do have issues with. This is good ammo at decent pricing. I have put many, many rounds down range with no issues. I've been purchasing from LG for the past six months and noted some of the negative comments, but since they are somewhat dated, I can only assume whatever caused others to be critical is no longer present with current production. Or, if I was the skeptical type, might question the nature and motivation of these comments. By definition user comments give everyone a platform. Be a wise consumer and sort through the customer information, read the info provided by the company, and follow your instincts. I did, and won't hesitate to buy from LG in the future if it makes economic sense (price vs. quality) to me. I have used 250 rounds with no problems. I will be ordering again. Ordered 3000 rounds, shot 2400 and had 1 misfire. Shooting Glock 34, sig p938 and my Just Right Carbine 9mm version. Perfect range Ammo. Second time for this ammo and was not disappointed. Worked flawlessly in both my Hi-point 995 Carbine and my Beretta 92. 3" grouping at 50 yds with the 995 and 3" or less with the Beretta at 10 yds. Will continue to use as value and quality are quite good. great target ammo . just one complaint the cost it could be a bit cheaper otherwise than that its great Ammo! This is not my first order of MBI, its my preferred practice Ammo. I also used this in an IDPA match and it too ran flawless. I'm happy with the quality and the price will definitely buy again. This is the third time we have used this ammo and with 3000 rounds we have had only 4 duds. We retried the duds with two different pistols to eliminate a striker issue. Not bad at all for the price and quality. Burned through a couple thousand rounds of this stuff and it's been great! No duds and only a couple FTFs. I can live with the rate FTF for this price! Decent accuracy, but good enough for range rounds. I've only shot about 100 rounds so far, but no problems and you can't beat the deal. This ammo works wonderfully in my glock 17. No problems at all, smooth operation even with rapid shooting. I will definatley buy again. Excellent ammunition. Have shot this in half a dozen 9mm handguns and a 9mm carbine. Functioned perfectly through a thousand rounds. Best value anywhere! Shooting this ammo through a Hi-Point carbine. We'd already tested a number of different loads and found this combination to be the most accurate. So far it's only been 200 rnds but no flaws at this time and shooting consistently on target. Great ammo, no issue with performance or accuracy! I have purchased 7-8K rounds of this ammunition over the last two years. I only had two rounds with a failure to fire and no squibs. I also have purchased about 2K rounds of .38 Spl. with no failure to fire. No issues of accuracy or light loads. Just as good as most commercial target ammo for sale today. I supplement this ammo with my own reloads in 9 MM. About 1 of every 15 rounds fail to feed properly in my XDS 9. The problem seems to be the diameter of the casing being slightly too big. After firing a round the next feeds, but the slide fails to go into full battery. If I tap the slide into battery it will fire and eject the cartridge as it should. Having to tap the slide into place is unsafe, but if done with the muzzle pointed down range, is passable. I will probably not order more of these for this gun. However, I use their 40 s&w all the time in my S&W full size 40 without a hiccup. Great for my S&W, not so great for my XDS 9. I've purchased about 5-6 thousand rounds of this ammo. Love it. I can't think of a single misfire. I shoot Berettas, Sigs, Rugers, and SA's. None have issues with this ammo. A bit dirty compared with factory originals (PMC, Geco) but overall for the price its a great deal. A few casings have jammed but this may be me as a novice. SW 1911 9mm pro series, gone through 1000 rounds, and now into the second shipment. Accuracy is not always consistent but that may be partly me getting tired after 200 rounds of non-stop practice. LG is awesome. I've bought and shot about 3000 rounds of this through the past 6-7 months, out of various pistols: Sig P938, Glock 26 & 19, Walther PPQ, and CZ 75B. No malfunctions. I did notice two rounds that were a bit compacted with the bullet seated deeper into the casings than normal, and tossed those. Will recommend to my friends anytime. 700 rounds of 1000 fired, no issues at all. Sig 938, hk vp9 and fns 9c all fired without an issue. Accuracy of rinds no noticeable different than factory originals Will order again and will use lucky gunner always as service is great. Shot 200 rounds and not a single misfire. The gunpowder was a little more acidic and smokey than other ammo I have used, but 200 rounds in 30 mins and not that good of ventilation. I've shot over 400 rounds through a G-19, Sig P229 and M&P-9, and no FTE's or FTF's. So far great ammo for a great price. I'll be buying more for the range. Good stuff, 600 rounds, no miss-fires, no jams and good service from Lucky Gunner. I have been very pleased with this product. I have shot 600 rounds thus far, some through a Dan Wesson 9mm the remainder through a Kimber 9mm. I have had no miss-fires or jams. 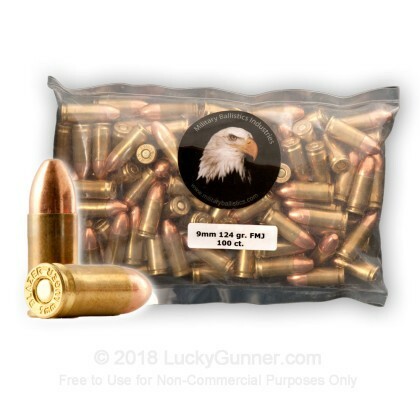 Good clean running 24 grain ammo at a good price along with good service form Lucky Gunner. What else can you ask for??? J.P. Purchased jointly with some others. Mine have been shooting fine. My brother Mike and my friend Bob, both had rounds get stuck in pistols due to oversized rounds and it took great effort to clear pistols. Both pistols were Glocks. Great buy with a couple duds. So far I've shot 400 rnds and had 3 duds. All of the faulty rnds had an angled bullet as it was set incorrectly causing the bullet to cant in the casing. Easy enough to get rid of but still concerningn as I've bought about 5000 rnds of .40 cal and never had one misfire or dud round. Still a great deal! Only fired one bag so far with my M&P 9c but no problems. Will update when I fire more. This ammunition is very good for practice. The quality is above average. Awesome Ammo. ZERO FTF - FTE. Clean. Reliable! This was the lowest cost per round I could find for brass cased 9mm. The shipping was quick and easy and they arrive in labeled packages of 100 loose rounds. The ammo looks just as good as factory brass and you can see the different brands of casings they used. The only reason I couldn't give it a full five stars is because I had 1, and ONLY 1, failure to eject after going through 500 rounds of the ammo. I definitely recommend this round and LuckyGunner and will be getting more in the future! Purchased bulk amount from MBI...had multiple half fires leaving bullet halfway in barrel. Jammed 4 different weapons. Will never purchase from this manufacturer again. Saving grace was Heidi Gunner and company stood behind their sale and made things right. That alone will keep me coming back to this company. Outstanding service and was treated extremely well... I'll continue to be a customer. I've used about 1100 rounds in uspsa competition with no problems at all. I just went through my 1000 rounds. About 800 of em with my glock 19, 200 with my Kimber. Not one single failure.